Andre has won eight Grand Slam singles titles, and is one of only five players to have won all four Grand Slam events. He is considered by many tennis fans to be one of the most complete and natural talents tennis has ever seen. Andre is the only male player in the Open Era to have won every Grand Slam singles title, the Masters, the Davis Cup and the Olympic Gold medal. He is also the only player to be ranked in the Top 10 in three different decades. 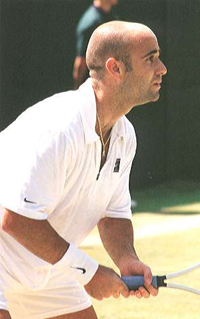 Andre became a frequent visitor to Marin County, California, since 1993 when he hired Brad Gilbert, a Marin resident as his coach and became the first un-seeded player since 1930 to win the US Open. The winning streak continued and he achieved a 73-9 record in 1995, winning the Australian Open and reaching the top ranked position in the world. It is during this period Andre fell in love with the beauty of Marin County and decided to have a home here. In 2001 Andre married German world champion fellow player Steffi Graf and purchased this Tiburon home where they lived with their two children part of the time. On June 24, 2006, Andre announced his retirement and moved to his home base Las Vegas to focus on The Andre Agassi Charitable Foundation. This is a rare opportunity for a buyer to purchase the magnificent home in Tiburon of not just one but two of the greatest tennis champions in the world.